Publications - Upper Delaware Council, Inc. 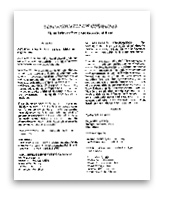 The Upper Delaware Council, Inc. (UDC) produces several publications that may be downloaded below or are available upon request in hardcopy format. A free newsletter about the environment and people of the Upper Delaware River Valley in NY and PA, published twice a year in April and October. A Must Have for the Upper Delaware River Traveler! 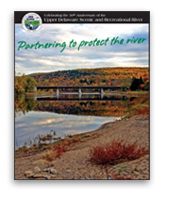 An overview of activities, amenities, river safety tips, and conservation contacts for the Upper Delaware River Valley region. 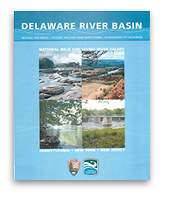 This guide features a large 17 x 22” map that lists Public Lands and Accesses, Accommodations, Bait and Tackle, Fishing Guides, Restaurants and Food, Liveries and Campgrounds that are located within the Upper Delaware Scenic and Recreational River corridor boundaries. This 36-page document provides guidance to undertake construction in the designated river corridor in ways that ensure harmony with the existing landscape. It is geared toward builders, developers, and landowners planning construction activity, as well as local officials in charge of reviewing development plans. A partnership for land, water, and people working together to conserve the Upper Delaware Scenic & Recreational River in New York and Pennsylvania. The year 2008 commemorates the 40th anniversary of the National Wild and Scenic Rivers Act. 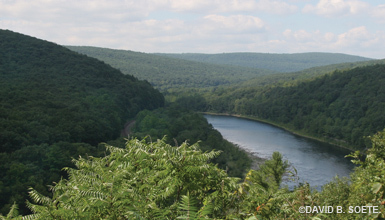 This law made possible the Upper Delaware’s Scenic and Recreational designation, which is marking its 30th anniversary this year. 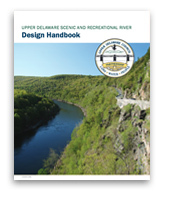 The Final River Management Plan for the Upper Delaware Scenic and Recreational River. A 20-page section of the River Management Plan. 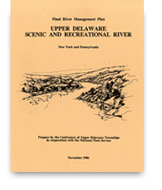 For a PDF copy of the entire Upper Delaware Scenic and Recreational River Final River Management Plan, dated November 1986, on a CD, please contact the UDC office by phone at 845-252-3022 or email. Outstandingly remarkable values (ORVs) are defined by the Wild and Scenic Rivers Act as the characteristics that make a river worthy of special protection. Thus, the foundation for wild and scenic river management is a clearly defined set of ORVs. The Interagency Wild and Scenic Rivers Coordinating Council has issued criteria for identifying and defining these values. 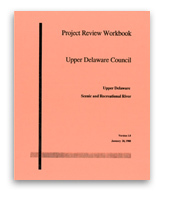 The Upper Delaware Council’s 1988 Project Review Workbook is the main document used to perform substantial conformance and project review for member towns. Outlined is the process and procedure for review to ensure development remains consistent with the intent of the River Management Plan, Land and Water Use Guidelines and the Upper Delaware Legislation. 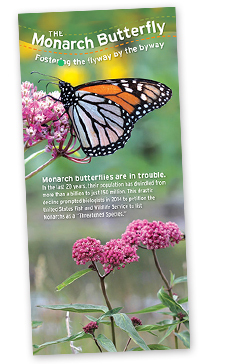 This 16-panel, full-color brochure, which opens up to a 15 x 18-inch poster layout titled “Bring Home the Butterflies… And the Birds & Bees, and Bats & Beetles and Other Pollinators” addresses the significance of the Monarch declines. This publication highlights the Monarch’s life cycles and cross-continental migration patterns, conservation efforts that can be easily undertaken in one’s back yard to grow milkweed and nectar plants that are critical to their survival. Tips on how to attract Monarch’s and best mowing practices to minimize negative impacts on their survival. A list of available pollinator plants in this area, and how to participate in national campaigns that are underway to protect the species are also included. The River Management Plan (RMP) for the Upper Delaware Scenic and Recreational River calls for local governments to play an important role in the management of the river corridor. We have discontinued updating this publication now that the information is posted on the UDC website. Click here to see the most recent list of Past TAG Projects. The Upper Delaware Council (UDC) recognizes that financial support is critical for its member towns and townships to institute effective programs. The U.S. Department of the Interior provides annual funding to the UDC through its Cooperative Agreement with the National Park Service to enable a Technical Assistance Grant (TAG) program.